Showing results for tags '10 gallon'. 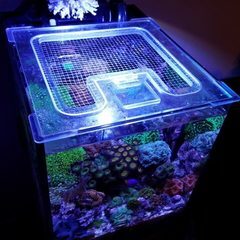 Hello everyone, I recently joined the forum to educate myself on nano reef keeping as I venture on my own adventure. I am a college student at Penn State and I understand that a small tank will require much more care than the larger tanks, but I figured given my situation, a nano tank would be the best choice. So, after weeks of careful planning I finally got myself a 10 gallon Waterbox cube along a AI Prime HD from Saltwateraquarium.com. 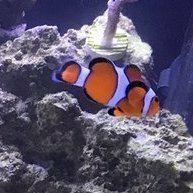 I went to a local fish store and got about 10 pounds of Caribsea Life Rock Shapes, saltwater and off I go to set up my tank. Current equipment in this tank is the following: Tank: Waterbox cube 10 gallon Lights: AI Prime HD Heater: Cobalt Neo-Therm Heater 50w Return pump: Stock pump Skimmer: Hydor Slim-Skim Nano Protein Skimmer (Fits like a glove!) Refugium light: Innovative Marine ChaetoMax 2-n-1 Refugium LED Circulation pump: IceCap 1K Gyre Generating Flow Pump ATO/AWC: AutoAqua Smart AWC Touch The first chamber of the back will house filter floss media for mechanical filtration and a small refugion with chaeto and ceramic media for bilogical filtration. The second chamber will hold the skimmer and some more ceramic media. The third chamber holds the heater and return pump. There is no sand in this tank since I intend to have strong water movement and will make it easier to clean. As of the time writing this post, the tank is in the third fourth day of cycling with no lights. Livestock that requires feeding will be added next year, until then, some input on the livestock would be awesome. What would you guys put in it? 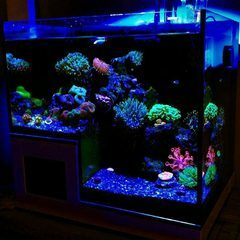 The plans for this tank is to eventually incorporate some sps corals. I am some time away from that, so in the meantime I am learning as much as I can. I am not an expert on reef keeping, but I am determined to experience and learn, hopefully not the hard way. I do not expect this to be an easy adventure, but surely will be fun. An Education & New Start for "The Phoenix"
Help me convert my 10g freshwater aquarium to a nano reef tank please!